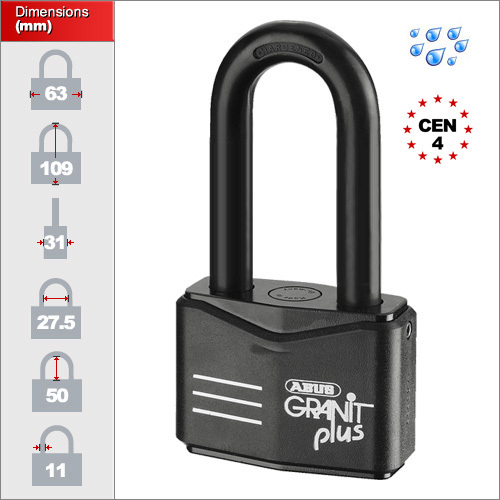 The world leading Granit padlocks are manufactured by ABUS in Germany. 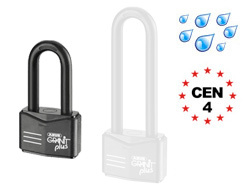 They are the only high security padlocks in the world to be cataphoretically coated to ensure they are a fully weatherproof to a marine grade standard and suitable for prolonged use outdoors and in a saline environment. ABUS have assured that these padlocks will be resistant to corrosion for 40+ years. 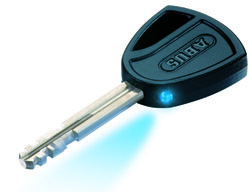 It affords an insurance approved CEN Grade 4 using an ABUS Plus cylinder which boasts 250,000 key different variations and keys that cannot be copied at a traditional locksmith without your unique 'code-card'. Please note that when this padlock is unlocked it retains the key until it is relocked once again. The shackle can also be completely removed from the body by removing a small retaining screw on the side. This allows greater flexibility should you need it. The shackle on the 50mm length has a groove at the base that allows it to be retained by a grub screw so it remains attached to the padlock when unlocked. With a key retaining feature also, this means that the padlock cannot be left unlocked at all - reminding the user to fasten it back into place before they can remove their keys. The shackle on the 100mm version removes from the padlock body completely and cannot be amended to be retained. This is because the majority of uses for this model are on container lock boxes which are designed to be a tight fit to prevent access for attack and therefore the shackel needs to be fit as tightly as possible. Please feel free to contact us for further advice. Click here for shackle release tutorial. All our Granit padlocks are delivered with 2 keys each inclusive of the price, one of which is an LED powered version to help find the keyway in low-light conditions. ABUS Granit padlocks come with keys that cannot be copied by a standard lock smith or a key cutting machine. Your padlock will come with a special unique Code Card which you can use to purchase replacement keys in the future. Many insurance companies require padlocks which are of a CEN Grade of 4 or higher. The ABUS Granit range are all grade 4 or higher making them suitable for the highest security requirements.